Our firm is a foremost name, engaged in providing an elite series of Plastic Laminated Tubes. Experts use the top grade material, which is sourced from industry permitted retailers to make our provided series. Provided range is extremely used by clientele due to their longer life and pocket friendly prices. In addition, we provide this series to our patrons at low prices. 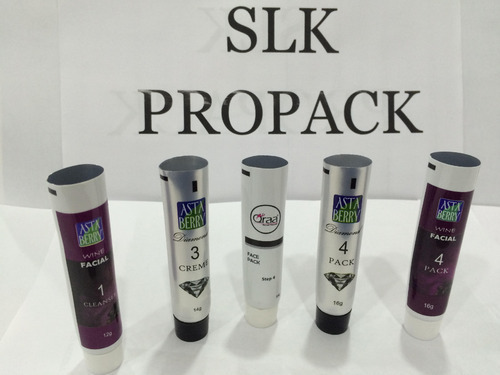 Founded in the year 2014, at Delhi, India, we SLK Propack are authorized manufacturer, exporter, supplier and wholesaler of Cosmetic Tubes, Laminated Tubes, Flexible Tubes, Pharmaceutical Tubes and Packaging Tubes. These products are extremely employed by clients owing to their fine finish, durability, longer life service and low prices. Our offered products are made by experts using the top quality material and advanced techniques. In addition, in order to present the top quality products, experts examine these products on varied industry norms. In addition, we have advanced development unit, which is embedded with highly developed machines and tools. Expert’s team who has rich industry skill and knowledge handles our manufacturing unit.